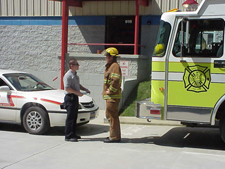 Any working commercial fire or any incident involving damage to a commercial building. warrants notification of the on-call inspector. that a fire protection system has been placed "out of service." Inspectors insure that these required (or otherwise installed) fire protection/detection systems are repaired and placed back in service as soon as possible. Inspectors are on-call for one week from 07:00 Monday until 07:00 the following Monday, and can be contacted for any fire inspection related needs that arise during these hours.